Dove New Melle on May 24 and 25. The vis was around 5-10 feet. Teh surface was in teh 60’s. Under the thermocline the water dipped to 43 degrees. Below forty feet light is needed. The bottom has a lot of silt and is easily distrubed by wash. It settles out rather quicly though as it is in larger clumps. The Quarry is limestone with between 2 and 3 acers of surface. is is shaped like a funnel with a good size hole in the center starting at 35 feet. We dove New Melle today (June 08, 2008). Surface temp was 80, bottom temp in the low 40’s. I think the best vis we got was about 10′ with some places a lot less. The weather was good, and we had a great time. I too was out there on 6-8-08 and second what SteveC says. They certainly have had a good bit of rain becuse all of the grass was pretty mushy. The air temp was in the 90’s so it felt great to get into the water after fighting with gear in the heat. Thermalcline was right around the 15′ mark, and just getting cold after that. The deepest we went was 30′ and saw 49* there. We did 3 dives and had a great time…. The dock is fixed, ground not soggy. The conditions are very slightly worse than above.. more particles in water. Temperatures are same. There was a significant muck level between 10’ and 25’. Dove New Melle 7/13/08. Things haven’t changed too much in last week. Visibility best is 15 feet. There is a definate thermocline about 15 feet and it gets rather cold. Need 7mm or drysuit. Gloves and hood a must to get under 15 feet. Visibility good on top, then an algae bloom about 15 and opens up again deeper. This was my first time at New Melle and I’m impressed. Bridgett is a great person and very socialable. I see very good things in the future of this new dive site. The muck level seems to be a little higher than the week before. Surface down to 10’ the vis was about 10’, between 10-25 the vis dropped to under 5’, then opened up below 25’ to about 15’. In some areas, in the muck zone, the vis was down to a foot or two. Visibility pretty poor down to 20′ maybe because of the rainshower early morning. Around 25′-40′ visibility was around 15′ but very cold. Not a real good dive for pictures because of all of the suspended particles. Really thick layer of muck on the right side of the quarry around the 15′ mark. Where is New Melle Lake at? We have started a very small dive instruction business I guess you’d call it. Just took it over from a guy getting out of it, very small, but always looking for somewhere to dive or take a student here and there. Sometimes we can’t get hold of the local quarry owner, so always looking for other options. I was out there on 8-6-08 and helped to install the new floating platform that is at 10ft just out infron of the main dock. coldest I saw was 61 at about 30ft. Went back out there last night 8-8-08 for a few more dives. Vis was still great at 20+ in some spots, and in others it was as low as 5. This time however I think I saw 55* as the coldest temp. I guess that this time everyone in my group was in drysuits so we were in the colder stuff longer and it takes my computer a little time to register the changing temps. Went to the Dive Stop Sunday as I was too lazy to go to Mermet. Wow, what a difference!. The dock is great and the table area is setup nice as well. Next step should be tank racks on the tables. The viz was great to 15 ft and after 20 ft, but through the 5 ft thermalcline it was rough. Overall the viz was about 20 ft below the thermalcline. Dave is doing a great job getting the quarry setup. Vis sucked today. There were swimmers mucking it up, but it was mostly floating stuff in the water, not silt. 5ft average around the wall, best I’ve seen was definitely under 10ft. Dove along the wall 8/28/08. Vis down to ten foot was five to ten feet. From ten to twenty foot around five feet. From the surface to about 15 feet, the vis was 5 to 10. From there on down it was total muck. Dove New Melle on Saturday. Very nice dive. Temp 70 degrees. Viz 20′ down to about 25. At 25′ there was a hazy muck level. Didn’t go much deeper so don’t know if it opened up after that. All in all a very good dive. Dove The Dive Stop in New Melle 9/20 & 21 for the Splash for Trash. Visibility is AWESOME above 25 feet, (well, until we started picking up trash…….) At any rate, shallow depths are the best they have been all year!! Dove 10.10.2008 visibility was 20-25 feet above 29 feet, and 5 feet below that. Water temp 71 on the surface, and 68 at 25 feet. Didn’t go through the ‘cline. Dove 10.26.08, visibility was 20 to 25 feet above 33 feet, and 5-10 below that level. Water temp 62 on the surface down to 33 feet, and 54 degrees at 50 feet. Vis still holding good. 20+ feet down to 30 feet depth. Temp at depth about 58 deg. This was the last official open day of the season. Vis is still good, about 20′. Temp about 55 deg. Went out to The Dive Stop today… There was a huge downpore of rain yesterday so the vis above 15ft was about 3 – 5 ft. From 15′ to 30′ the vis was around 15 – 20. The water temp was a brisk 42*. Posted by Skdvr on ScubaToys….. If you buy a season pass, You will receive two FREE daily entry passes! We are also giving away air fill cards. For every 10 fills you will receive 2 free! In the quarry at Dive Stop, We have hidden two disk. By the way before anyone asks. No, I do not work for The Dive Stop, it is just a local quarry that I would like to see succeed. Stopped by The Dive Stop on 4/11. Didn’t do any diving, but the water looked very clear. Could see the platform easily….I would say around 20′ viz from the surface. Dave said the water temp was in the 50’s. Vis was 15 – 20 ft.
We had 46F on the 12th. Vis is pretty nice, the usual, milky in the shallows around the old dock. There is now a changing room btw. The rain held off and it turned out to be a pretty nice mourning. The surface temp was about 50 and was in the upper 40s down to about 35′. The vis averaged about 20′ , maybe a little more in spots. The quality of the vis didnt seem to depend on depth as much as area of the quarry. Had a great time. BTW, as of this mourning, the season passes had still not been found. We made 2 dives this morning(4-26-09) and had a great time. The air temp was around 80 degrees and it was sunny. The surface temp according to my computer was 61 degrees and 42 degrees at 50′. The vis varied but I would say averaged between 15′ and 20′ which was pretty good with the amount of activity in the quarry today. There was an ow class being taught, but they really didnt muck things up at all. This is a credit to the instructors at Y-kiki divers Im sure. I cant wait to get back. We dove The Dive Stop today. The vis was not too good. I’d say 10′ at best. They have had alot of rain this week, so hopefuly it will be better soon. The surface temp was nice, somewhere in the 70’s. Met up with SteveC and Robbin at New Melle for a day of diving. When we got there a storm system was blowing through with severl hits of lightning and heavy rain at times. Chris from the dive shop came down and gave us an update on the weather; which, would be blowing through quickly and made sure everybody was out of the water. While we waited we met a couple of divers (Gary & Ken). Gary had been at Bonne Terre for the treasure hunt the day prior. SteveC & Robbin also attended; so, we had a great conversation about the activities at the treasure hunt. Finally, it was time to get in the water with the storm blowing by. We started on the west dock since a class was on the other. Conditions – Very merky basically 0 viz on the surface with the thermocline at 15′. Below the thermocline it opens up to about 10-12′ viz. Temps were in the mid 50’s. It seemed to be much better on the other side of the quarry by the sunken boat – viz seemed to open up. After the first dive, we decided to call it a day of diving and slowly packed things up while enjoying much conversation with Gary and Ken. The sun came out and it turned out to be a great day. We walked back down to the dock and the water seemed to clear up greatly after the rains. I actually thought about unpacking and jumping in again, but due to a 3 hour drive home, thought better of it. All in all a great day. Diving wasn’t the best, but had some good diving conversations. Heya, Snagel, we were there at the same time! Were you at the nothwest parking area? We were parked at the south area… if you saw the big guy with the beard diving with the small woman, that was us. Vis the last weekend of march was mostly in the 10 ft range, water 70ish to 66 ish, colder under the clines. Our last dive of Sunday was cut short by the storm… we were actually down along the wall on the south side of the quarry when it came in. We were diving shallow along the wall about 15 feet down looking at the ledges where the fish were hiding when another diver (Ken from Y-Kiki who was teaching students around the south platform) dove over to us and gave the thumbs up signal. Surprised, it took a minute to realize he was talking to us… we went up and the guy running the quarry today was on the shore, asking all divers to get out of the water because lightning was striking nearby… I was down to 1000 PSI anyway and we were just tooling around till I hit 500, the dive was basically over, and no sooner were we out than the storm started popping around us What was already bad visibility looked like it was going to be quickly deteriorating to nothing so we just left the last tanks in the car and decided to leave it at two dives today. First time I have ever had a dive called because of rain (I dove through Ivan last year, that was amazingly bad viz). Anyway, we ended up doing 4 dives for the weekend. Yep, we were at the NW parking area – waiting out the storm. We seen you guys swimming in. Actually, later after the storm and sun came out the water seemed to clear up quite a bit (atleast from looking in from the docks). I was half tempted to unload everything and jump back in. Vis is not bad in some places, but in other places it still is awful (especially along the north wall). 20 was 66 degrees, 15-20 ft vis in some spots and 5-10 in others. 30 feet was 51 degrees… lowest I went was 36 feet and it was pretty well 25 feet down there. Did the stop on July 3, water was 80 at the surface, 65 at 20 feet, 62 at 30 feet and I didn’t go down into the hole but it is cold there (50). Watched them shoot off fireworks from the lake, then we went for a night dive. VIs was 10-15 pretty much everywhere except the north wall, where it was 1-5 as it has been most of the year. To Dive for WWII Veterans! TO SEE THEIR MEMOMIAL IN WASHINGTON. D.C.. I measured the vis to be about 10′ at the sunken boat. It got mucky at about 20′ deep, and then cleared up again towards the bottom. No hood was needed above the thermal cline at about 15′. We plan on being there again this Friday also. 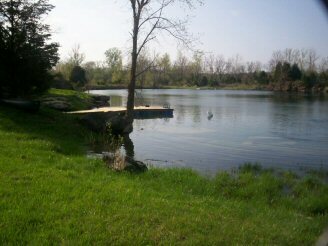 Made quick dive at New Melle to practice skills for the weekends dives at Bonne Terre Mine. Temps were in the mid 50’s below 20 feet. There is a nasty muck level about 15 feet with almost total blackout. Below the T-cline it opened up on the East side of the quarry. The west side (as usual) was pretty much a “muck-out”. We helped out (we’ll actually, we watched) as they were installing another platform on the East side. The theory is this (all wooden) platform will be sunk 5′ below the surface over the 10′ platform. This will allow for a place to work on skills with OW students. As usual the staff was very freindly and accomodating. Dove at the Dive Stop yesterday. They are still in the midst of an algae bloom. It gets a little better once you get below 20 feet. They say that they have treated it, but its still very very green. It also got better once you got close to the rock walls. So hopefully its clearing up. The deepest part is one of the darkest places I have ever dove without something being over head. At 50′ its 50 degrees. Upon arriving, we were greeted by a group of people working on the new building, and by the looks of the facilities, (docks, platforms, etc), they’ve been very busy. The place is constantly improving. 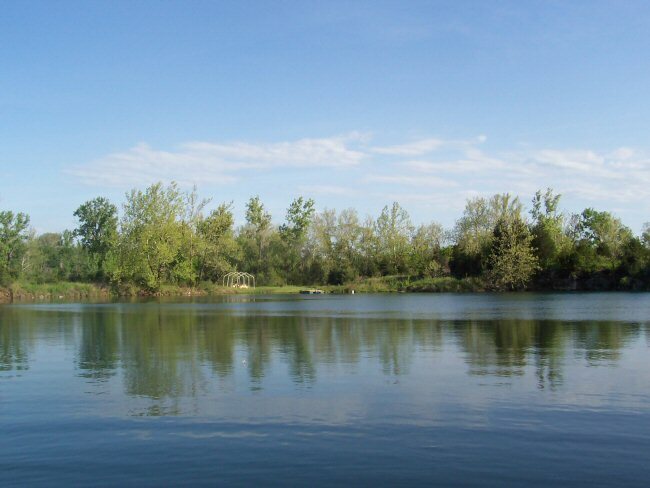 As for water conditions, surface temp was 77 degrees and viz was 15′-20′. At around 22′ there was thermocline and temp was about 70 degrees. Now from 22′ to about 30′ it was clear, maybe 20′ viz, but at 30′ it was total “brown out”. I went to 37′ and could’nt see my hand in front of my mask. My dive buddy said I just completely disapeared for a minute. Not sensing any clearing below me, I returned above 30′ where we remained for the rest of the dive. I talked to another diver, and he said he did’nt find the bottom of the “brown out” either and that it was everywhere in the quarry. My buddy and I both had a great time and plan to return soon. If the bottom half of the quarry continues to clear like the top half has, we should have some really good diving in the weeks ahead. The vis was a good 20′ down to the thermocline at about 25 deep. From there it got very murky. The temp was about 72 deg down to the thermocline. Over all it was a very good dive. We helped install a couple of “flying saucers” in the quarry. I think there is about 3 of them right now. I asked if there is near by neighbor hood without cable television right now! They have the new office/ dive shop going and things are looking real nice. Dove with Gary (gbray on ScubaBoard) and Jeanne (Biologic on Scubaboard) October 18, 2009. Vis was really good, 30 feet+. There was no cline down to 40 feet, but the water has cooled off a LOT recently… 56 degrees on my computer. There is an Underwater Pumpkin Carving contest being held this weekend at Dive Stop. It wil be on Saturday, October 24th between 1-4pm. The cost is $35.00 for divers and $10.00 for non-divers….and of course it’s BYOP (Bring Your Own Pumpkin). The cost includes the entry fee, dinner, drinks and prizes. For more information check out Y-Kiki Divers website. I have attended this before and it’s a very enjoyable time. We stayed on the far side as there was a large class using the front dock. The vis was about 20′ and the temp was in the upper 50’s. A very nice changing room has been added to the far side area. Dove the stop the last two weekends of April, 2010. Temp: Surface was about 60, 20 was about 55, 49 below the cline at about 30 feet. Vis ranged anywhere from 5-10 feet, except around the NW dock where they were working on it, blowing out that corner of the quarry entirely on one day. The next week, vis was 5-10 feet. Dove the Stop two weekends ago, vis was terrible. 5 feet max. 82 on the surface, cline at 18 feet took me to 66 degrees, deeper it is still 48 degrees. It is with utmost regret that we announce the closing of Dive Stop, to recreational scuba diving. This means that we will no longer be open to recreational diving at our New Melle location. Dive Stop has had a shift in focus. This shift is due to many factors. Some that we can control and some that we can’t. It has been a GREAT four years. We would like to Thank everyone that has supported us over the last 4 years. With the closing of Dive Stop, you will see a new Company arise with more emphasis on Public Safety and Recreational training. The goal of this new company is to create a more balanced entity, which will focus on the true nature of what scuba diving is all about. In the next few months you will see more articles and training events. That will touch on Scuba Diving. Why are you scuba diving? When to go the next step in your training? Public Safety Diving. Are you qualified? We will still offer Open Water Scuba Diving through NAUI and PADI. With even more courses through our new relationship/partnership with Public Safety Divers Association. Swift Water Rescue Instructors level I, II, III. Public Safety High Angle Rescue and Confine Space Rescue for Land and Sub Surface Special OPS. Again Thank you for your support in the past and your ongoing support in the future.